Even though Ventura County does not regularly receive significant rainfall, there are still opportunities for water damage, mold, and other natural disasters to affect the homes and businesses in the community. 911 Restoration of Ventura County wants to be able to help property owners with any situation they may find themselves in, whether it be with a home flood, sewage backup, or wildfire. The repair technicians are available 24/7/365 to take on any challenge, no matter what time it occurs. If you are dealing with a water emergency, then professionals will be at your door within 45 minutes. 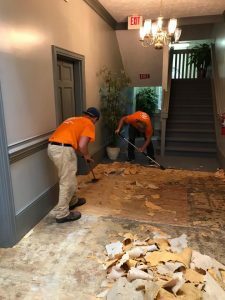 We will implement same-day, flooding cleanup services, to keep the water damage from impacting the structural integrity of your property and causing a mold infestation. 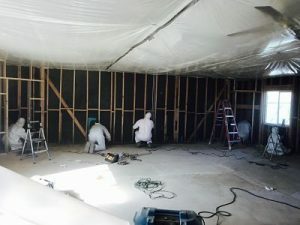 911 Restoration of Ventura County is locally owned and operated, so you can feel confident that the technicians are keenly aware of the restoration services property owners in the community needs. Call the highly trained technicians when you need water restoration services, and they will work hard to give you the peace of mind you deserve. It is best to leave water remediation to the professionals to avoid further troubles down the line like mold contamination and structural damage. 911 Restoration has been providing quality services to the people of Ventura County for long enough to know that damage from water incidents can happen at any time. If your water damage was a result from a pipe burst, ceiling leak, water heater explosion, or localized flooding incident, then you only need the professional assistance of 911 Restoration of Ventura County. A wall leak can cause water damage to a wood structure which can then lead to mold, especially during the hot summer months. Fortunately, our experts are also trained to implement mold removal services. So, contact the local experts when you need the help from a restoration company that cares and understands your needs. Mold contamination induced from leak and flood incident are one of the most common issues that property owners have to deal with. Having mold in your home can create health hazards for those who breathe in the spores on a regular basis. Mold inhalation can cause allergies and respiratory issues, which is why it is crucial to act fast when you see mold on the wall or anywhere else. Spores can travel throughout a property quite quickly, so experts wear full hazmat suits and implement containment barriers to keep themselves and the other areas of your home safe from contamination. 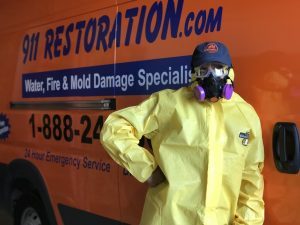 Most mold infestations are usually the result of an improperly mitigated water damage, which is why technicians are careful to address both issues when they are called to a mold removal job. By understanding the relationship between mold and water, property owners can avoid a mold situation by making sure to immediately clean up any spill, leak, or water intrusion of any kind. Don’t let your property become exposed to mold. Call the mold specialists, and they will remove hazardous mold in your house or building today! When property owners in Ventura County experience a sewage backup in their property, they need experts to come in and clean up the toxic black water as quickly as possible. Sewage cleanup services need to be implemented with the utmost professionalism because the waste can quickly spread to unaffected parts of the home and contaminate people and pets. When a sewage backup does occur, it usually comes from a malfunctioning backup valve causing a toilet to overflow. Raw sewage is highly dangerous, making any DIY attempt an extreme risk, especially if you do not have any experience cleaning up sewage spills. We treat overflows as emergency flood cleanup situations and will arrive within our 45 minute time period to get to work extracting the black water right away. By implementing sewage restoration quickly after the overflow has occurred, the better we can remove the odor and get your property smelling fresh again. Contact 911 Restoration Ventura as soon as a sewage backup occurs within your residential or commercial property, and their specialists will make your space a healthy, clean environment again. Santa Ana winds and scorching summer heat can cause wildfires throughout Ventura County, devastating the surrounding agriculture as well as nearby homes and businesses. Our expertise in smoke and fire damage restoration is key to helping property owners when a wildfire or internal fire affects your home or business. Repair techs will clean up smoke stains, ash, soot, and tar that have damaged your property in the fire. We will also use deodorization techniques to remove the foul smell caused by the flames. Water remediation is also a crucial part of fire damage restoration. When a fire department puts out a blaze, they do so with tremendous amounts of water that tend to cause disastrous levels of flooding in the extinguishing process. Customers can depend on specialists to handle all of the smoke and fire challenges, as well as any water remediation that needs to take place. So, give the professionals at 911 Restoration of Ventura a call as soon as the fire department puts out the flames. Earthquakes and wildfires are two of the leading natural disasters that frequent Ventura County. Both can cause structural damages to homes and businesses, putting property owners in a position to reach out for professional disaster restoration services. Although rare, the Ventura area is in proximity to the Pacific Ocean and, at times, extreme weather can cause water damage and flooding in the community. If a severe rainstorm tears a hole in your roof and creates ceiling leaks, or if a local area flood inundates your home with water damage, then you’ll need the expertise and skills of dedicated restoration professionals. Disasters such as high winds and even sea surge can also affect the Ventura area and to protect against these situations, the technicians at 911 Restoration make efforts to provide their services as quickly as possible. Don’t let your property be affected by a natural disaster. Contact the specialists at 911 Restoration Ventura and allow them to implement disaster restoration services that will give you and your family a Fresh Start!